Something a little different for dessert on Thanksgiving. 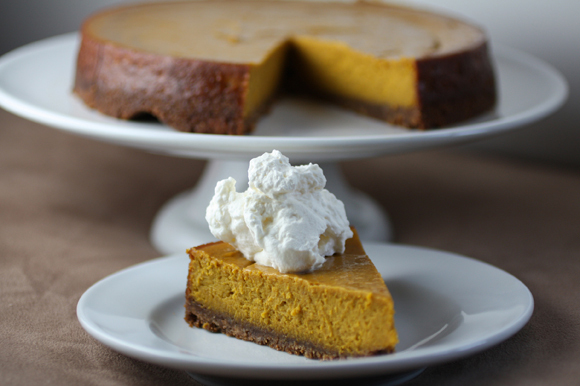 Nope, it’s not pumpkin pie. Use your 20-20 vision and you’ll realize it’s actually carrot tart. Those of you who have followed me long enough know that I am not a pumpkin pie fan. I love almost everything else that’s pumpkin, though, if that makes any sense. 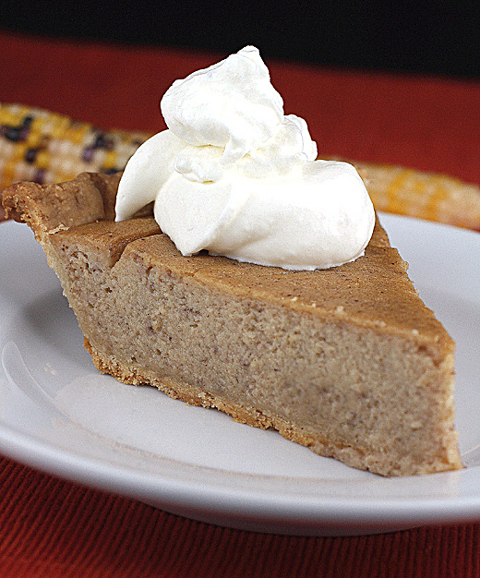 So, every Thanksgiving, I try to offer up something that is decidedly not pumpkin pie. “Vanilla Carrot Cream Tart” fills the bill perfectly. It’s from the new “The Chefs Collaborative Cookbook: Local, Sustainable, Delicious Recipes from America’s Great Chefs” (Taunton Press), of which I received a review copy. 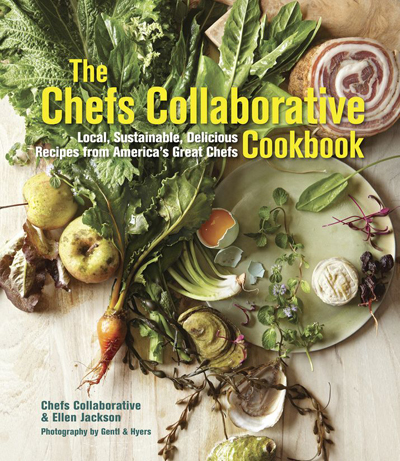 It’s written by Portland, Ore.-pastry chef turned food writer, Ellen Jackson, and members of the Chefs Collaborative. The non-profit organization was founded in 1993 by a few visionary chefs, including John Ash, Rick Bayless, Susan Feniger, Nora Pouillon, Michael Romano and Alice Waters. Their goal was to encourage employees, diners and other chefs to join the food revolution promoting sustainable, organic, local and smart eating choices. The cookbook includes 115 recipes from member chefs, including Jesse Cool, Dan Barber, Vital Paley and Hugh Acheson. There are handy sections explaining meat labels, the raw milk debate, and GMOs. 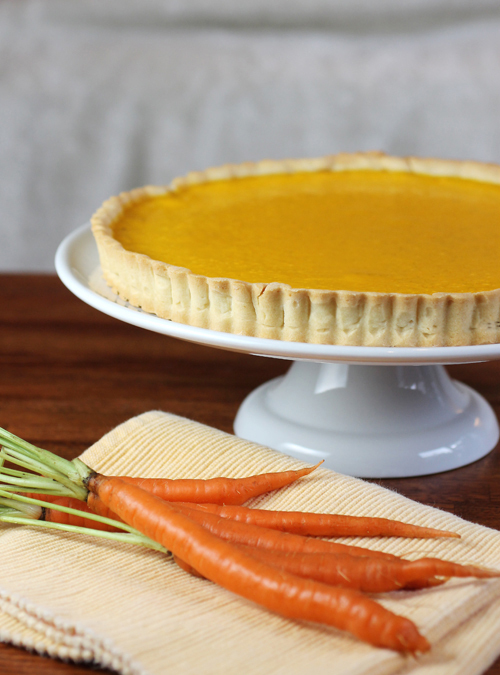 The carrot tart recipe is from Phoebe Lawless of Scratch Baking in Durham, NC. And what a winner it is. Carrots get simmered with heavy cream and vanilla bean, before being pureed and stirred into a filling of eggs, sugar, and buttermilk that ends up with a delicate, creamy consistency. 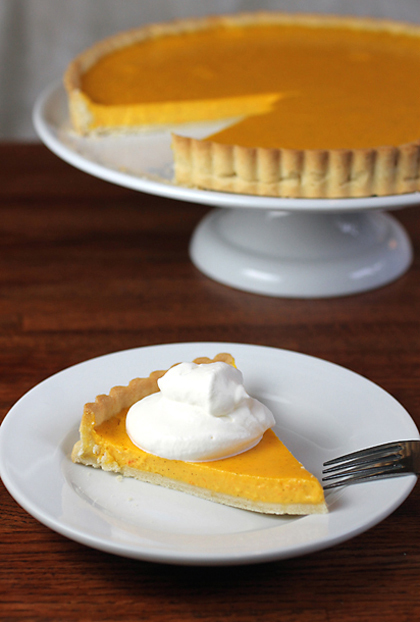 The tart bakes up with a far more vivid orange hue than pumpkin pie, which will make your guests crane their necks in curiosity as you bring it to the table. Its taste is reminiscent of carrot cake, but far less sweet, especially with the tang from the buttermilk that almost mimics that of cream cheese. 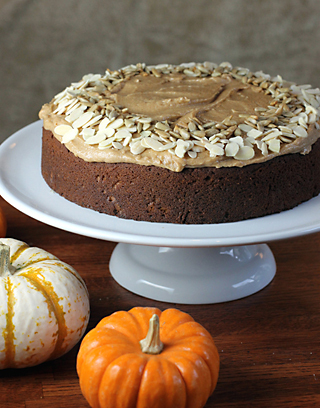 It’s also a far lighter dessert than either carrot cake or pumpkin pie. Much more elegant, too. 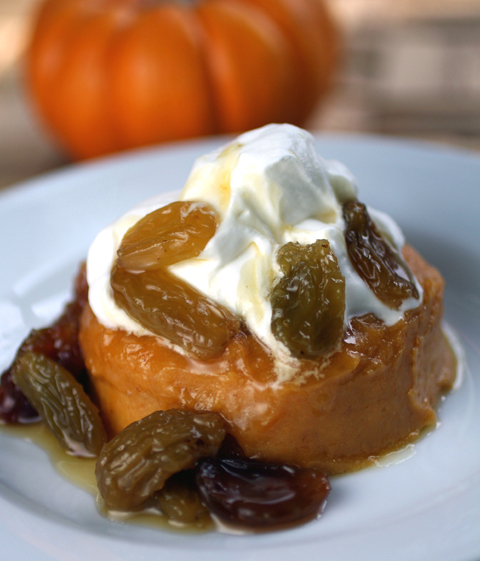 Serve with a fluff of lightly sweetened whipped cream, if you like. 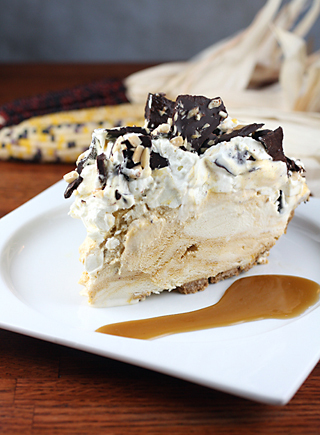 This Thanksgiving, surprise your guests with a dazzling dessert that will leave them in wonderment. No doubt, they won’t miss the pumpkin pie, either. 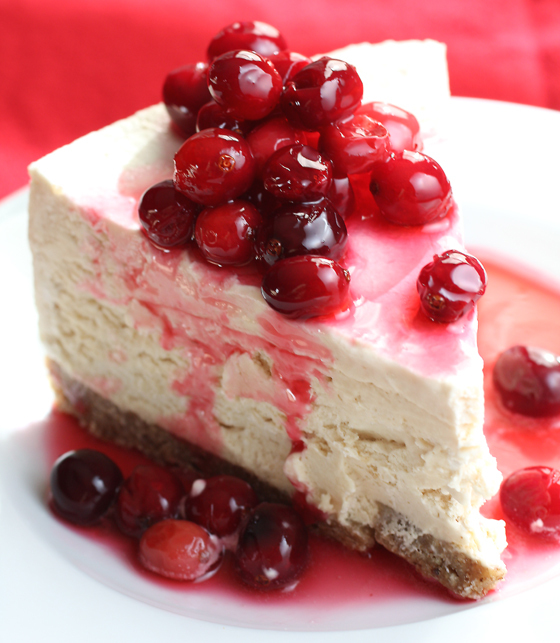 Prettier than your average pie, too. Combine the confectioners’ sugar, salt, and butter in the bowl of a food processor. Pulse several times until the mixture resembles small pebbles. Add the egg and heavy cream and pulse again. Add the flour all at once and pulse in bursts until the dough begins to come together. Scrape the dough out onto a clean, lightly floured work surface. Working quickly and using the heel of your hand or a dough scraper, smear the dough across the floured surface a little at a time to incorporate the butter. The French technique, called fraisage, is the key to a tender, flaky crust. When all of the dough has been smeared, gather it into a mass and gently form a flat disk that’s 1 1/2 inches thick. Wrap tightly with plastic wrap and chill for at least 1 hour or freeze for up to 1 month. If using the dough right away, after an hour, remove the dough from the refrigerator and allow to sit out for 10 to 15 minutes, to make it easier to roll. On a lightly floured work surface, roll the dough into a 14- to 15-inch circle that’s 1/4 inch thick. Fold the dough in half and carefully lay it in a 10-inch tart pan with a false bottom and fluted edges. Lightly press the dough into the corners and fold the outer edge of the pastry into the sides, pressing to create an even wall that extends just beyond the top of the pan. Pinch off excess pastry and reserve the extra dough. Prick the shell with a fork and freeze for at least 15 minutes. To make the filling: Combine the carrots and heavy cream in a small nonreactive saucepan. Split the vanilla bean in half, scrape the seeds and add them to the pan along with the pod. Simmer the mixture, covered, over low heat until carrots are soft, about 20 minutes. Cool completely, remove the vanilla pod, and puree with an immersion blender or a regular blender until very smooth. In a medium bowl, whisk the eggs, egg yolk, sugar and salt until well combined. Add cool carrot puree and buttermilk. This mixture can be made and refrigerated 2 days ahead. Heat oven to 325 degrees. Bake the tart shell for 15 to 20 minutes, or until the bottom is lightly golden. If the dough begins to bubble up, use a clean dry towel to gently press it down. Pour the filling into the partially baked shell and then bake for 30 to 40 minutes, or until edges puff slightly. The tart will be jiggly in the center and appear to be underbaked — this is okay. Cool at room temperature for 30 minutes, then chill until set, about 2 hours. Remove the tart from the pan and serve at room temperature the day it is baked or chilled the following day.